Chinese President Xi Jinping held talks with his Turkish counterpart Recep Tayyip Erdogan on Wednesday, vowing greater coordination on “issues of major concern”. Following the Xi-Erdogan talks at the Great Hall of the People in Beijing, the two sides signed a mid- and long-term plan for trade and economic cooperation. China’s Ministry of Commerce figures show bilateral trade volume between China and Turkey in 2014 surpassed $20.9 billion, registering a year-on-year increase of 3.57 per cent. China and Turkey, both important members of the G20, face mounting common challenges and obligations against the backdrop of a complex and volatile international situation, a gloomy global economy and grim security situation in West Asia and North Africa, said the Chinese president. “We consistently advocate that China and Turkey should support each other on major issues and deepen our strategic cooperative relationship,” Xi told Erdogan. “The two sides should enhance mutual trust and lay a more solid foundation for friendship. [China] is willing to boost law enforcement and security cooperation between the two countries,” Xi added. Xi also invited Turkey to join the ambitious Silk Road projects offering to link it with “Turkey’s development strategy in pursuit of common prosperity”, said Chinese agency Xinhua. Xi on Wednesday also hoped for more coordination with Turkey on global economic governance, climate change and other issues to safeguard the common interests of the two nations and other developing countries. Before leaving for China, Erdogan said at a news conference in Ankara that China provided the best offer for a missile defense system in Turkey and should “enrich” its bid. Washington has already said a missile defense system from China couldn’t be integrated with NATO systems. On Wednesday, Chinese deputy foreign minister Zhang Ming told reporters the two leaders also discussed the terror threats faced by the Chinese Xinjiang region. Erdogan told Xi that Turkey regarded the East Turkestan Islamic Movement (ETIM), which Beijing says is waging a violent campaign for an independent Xinjiang, as a terror group. “He said that … Turkey will not allow anyone to use Turkey’s territory to do anything to harm China’s national interests and security,” Zhang said. Prior to the talks, Xi held a red-carpet ceremony to welcome the Turkish president. 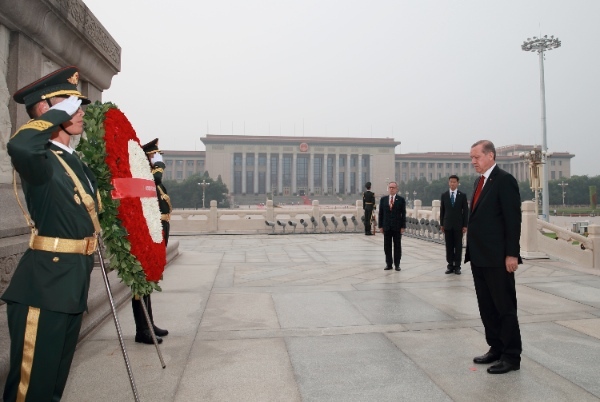 Earlier on Wednesday, Erdogan laid a wreath at the Monument to the People’s Heroes in Beijing.